Winesburg, Ohio, gave birth to the American story cycle, for which William Faulkner, F. Scott Fitzgerald, and later writers were forever indebted. Defying the prudish sensibilities of his time, Anderson never omitted anything adult, harsh, or shocking; instead he embraced frankness, truth, and the hidden depths everyone possesses. Here we meet young George Willard, a newspaper reporter with dreams; Kate Swift, the schoolteacher who attempts to seduce him; Wing Biddlebaum, a berry picker whose hands are the source of both his renown and shame; Alice Hindman, who has one last adventure; and all the other complex human beings whose portraits brought American literature into the modern age. Their stories make up a classic and place its author alongside the best of American writers. Sherwood Anderson (1876–1941) was an American short story writer and novelist. He was raised in the small town of Clyde, Ohio, served in the Spanish-American War, and managed a paint factory before abandoning his job and his wife for Chicago and the writer’s life. He was forty before his first novel, Windy McPherson’s Son, was published in the peak of the Chicago Renaissance. Winesburg, Ohio, his masterpiece, appeared in 1919. His other novels include Poor White (1920) and Dark Laughter (1925), but his short story collections were more successful. Two of his best are The Triumph of the Egg (1921) and Horses and Men (1923). After moving to Marion, Virginia, in 1927, he owned and edited two newspapers. He died in Panama during a trip to South America. Irving Howe (1920–93) was born in New York, and he attended City College before serving in the U.S. Army in World War II. He was well-known both for his social activism and his literary and cultural criticism, and in 1954, he helped found the intellectual quarterly Dissent, which he edited until his death. 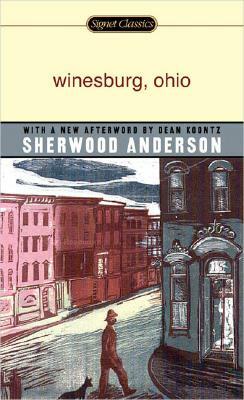 Among his enduring works are Sherwood Anderson, Decline of the New, Politics of the Novel, and World of Our Fathers. Dean Koontz was born in Everett, Pennsylvania, and grew up in nearby Bedford. He won an Atlantic Monthly fiction competition when he was twenty and has been writing ever since. His books are published in thirty-eight languages, and he has sold more than 450 million copies to date.